Don't stop til you get enough - Thriller Live has the Cliffs Pavilion audience 'shaking their bodies down to the ground'! It barely seems possible that almost ten years has passed since the untimely death of Michael Jackson. If ever there were a testament to how popular the musical legend and his music was and still is, then the opening night audience of the Thriller Live tour at Southend's Cliffs Pavilion were out in force to make a pretty solid case. Lead vocalist and Resident director, Britt Quentin, as well as getting to wear some of the iconic costumes that Jackson made his own, also really looks and sounds like the King of Pop too. Shaquille Hemmans, Rory Taylor (remember him from Superstar? ), Adriana Louise, Ina Seidon and Eddy Lima also share lead vocals with Britt and show off some pretty nifty dancing skills too, and also from Eddy Lima who almost brings the house down with his moves and not least with that iconic 'lean' in the 'Smooth Criminal' number. Every one of these vocalists is outstanding and highlights for me included 'Human Nature', 'She's Out of My Life', 'Beat It', 'Smooth Criminal' and 'Beat It'. 'Earth Song', one of my favourites from Jackson's later albums, HIStory, still manages to have so much relevance and resonance even now. 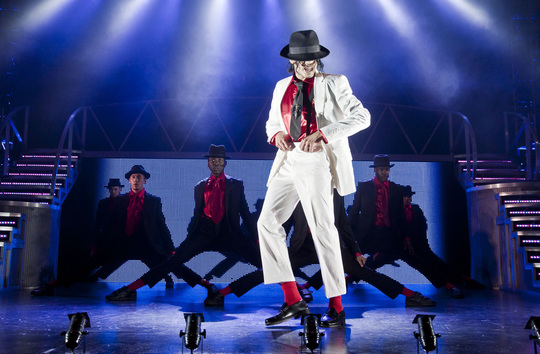 Anyone familiar with Michael Jackson will know what a stickler for perfection he was and Thriller Live's director and choreographer, Gary Lloyd, has done an outstanding job with the immensely talented dancers in this production. They faultlessly dance their way through each song with the most incredible amount of energy and passion and each and every one of them gives it one hundred percent, almost bringing the house down in the ‘Smooth Criminal’ number. Of course the production, cast and dancers wouldn’t be complete without the support of a band behind them and in this show the band is, quite literally, behind them! Sadly hidden behind a screen for most of the show, however, they are superbly led by Musical Director, Andy Jeffcoat and with guitarist, Allan Salmon, thankfully getting to break out and join the cast to give us that famous 'Billie Jean' guitar break solo These guys produce the most incredible sound and simply have to be one of the best live bands on the musical theatre touring circuit right now.